After a road trip that ran a little longer than expected, the Manitoba Moose returned to the comfort of Bell MTS Iceplex for practice today. Following three post all-star break road games, Manitoba’s early morning departure from Grand Rapids, Mich. yesterday went off without a hitch. Weather-related issues then delayed the club’s flight out of Minneapolis, leading to a travel day of more than 12 hours. 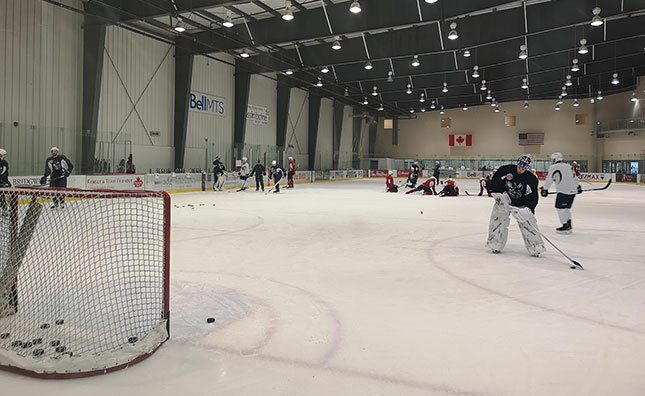 Despite the hiccup, a brisk skate at the organization’s west Winnipeg practice facility this morning got the kinks out and set the table for tomorrow’s 6 p.m. date downtown with Texas Stars – the opener of a six game homestand. No doubt about that. In the Stars, the Moose find another big Central Division matchup in the heart of the playoff chase. Manitoba has at least a point in seven of its last 10 games against Central sides, but the team is smarting after just one win on a recently completed stretch of six on the road. The Moose have played the Stars three times this season, all three times in Austin, Texas. So far the matchup has been very competitive with the Moose taking two of the three, the last in a shootout on Jan. 5. Saturday night’s game is Multicultural Night at Bell MTS Place, while Sunday’s 2 p.m. start falls on Polar Bear Jersey Day. For tickets to this weekend’s games, visit moosehockey.com/tickets.